Dakar’s more than 1 million inhabitants live on a peninsula that juts out into the Atlantic Ocean. Here in the capital of Senegal, only a few green urban parks offer outdoor recreation. At the city’s western coastline lies the “Corniche”, an area that used to be known as an unsafe place, where crime and unauthorised development dominated this public space. But the year 2008 marked a turning point for the Corniche. The municipality took advantage of an international conference of the Organisation of Islamic Cooperation taking place in Dakar to develop the coastal economy and to reimagine the Corniche as a place for recreation, art, and commerce. Nearly a decade later, the Corniche now has running and cycling tracks, park space for local biodiversity, places for children to play, concert spaces, and is lined with art galleries and shopping areas. This kind of “urban tinkering” has changed Dakar, by taking existing infrastructure and repurposing it for more flexible and adaptable functions. Cities face challenges from rapidly expanding populations, pollution, and climate change. Such reimagining of urban spaces is one aspect of reaching the UN Sustainable Development Goals – and not just Goal 11, for sustainable cities and communities. We live on an urban planet. The world’s urban population has grown from about 200 million in 1900 to 3.9 billion in 2014, with 2.6 billion more people projected to live in cities in 2050. Half of those urban dwellers live in Asia. China’s rapid urbanisation could lead to one of the largest human settlements in history. Meanwhile, Africa’s urban population is larger than North America’s total population. This unprecedented urbanisation comes with challenges typical of such profound social, economic, and environmental transformations. Like any ecosystem, urban centres will face water and biodiversity issues, heat island effects, and more, even as their demands affect surrounding regions’ ecosystems. China’s rapid urbanisation could lead to one of the largest human settlements in history. A conventionally designed and engineered process starts with tailor-made material and tools, always made with a specific function in mind. But many designs in time become outdated, obsolete, or inadequate. We suggest that urban tinkering as an approach has the potential to move beyond conventional urban engineering by replacing predictability, linearity, and design meant for one function and one function only. Urban tinkering would work to anticipate uncertainty and nonlinearity, and design for many potentially shifting functions. For example, conventional roofs originally designed for protecting buildings can be reimagined as places for solar power and urban agriculture. 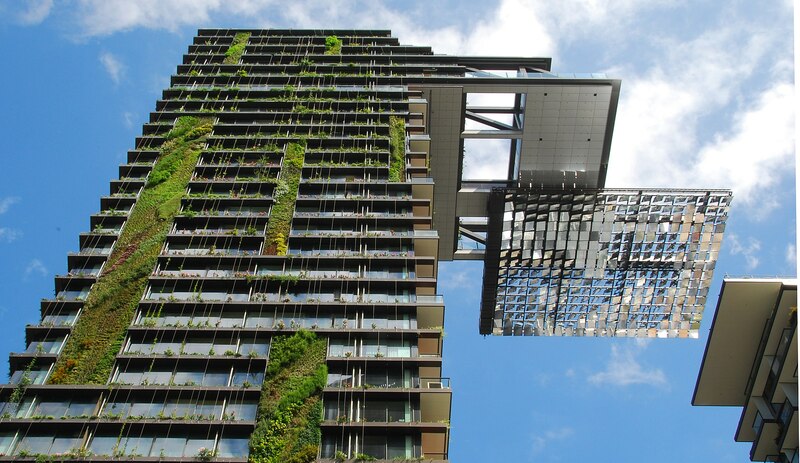 The urban sphere is central to building sustainability for people, planet, and prosperity. Because of its importance, we need expanded and flexible scientific research and knowledge generation about urban systems. Creating this new “urban knowledge” requires interdisciplinary efforts for greater understanding of complex urbanisation processes and their multi-scale interactions and feedbacks with the Earth system. Over the next few decades, researchers can predict with reasonably high certainty how overall demographic growth and rates of densification of settlements will change. But beyond 2030, the way these patterns will play out spatially is highly uncertain. The not-so-far-off future may have much more dispersed urbanisation patterns than we project today, due to many factors that may disrupt or change them. For example, human migration patterns might change because of global economic crises, triggered by changes in water availability that are influenced by human uses and climate change. These interrelated patterns will impact the configuration of cities. In light of this, we see two areas that most require acknowledging uncertainty and change, from local to global scales in the long term. First, urban infrastructure needs to change to address strong path-dependency. In other words, city structures – buildings, roads, industrial sites, water and sewage pipes – generally are built with one intended use or purpose, have limited lifetimes, and can lock cities into particular infrastructural development trajectories. A city’s social systems might be constructed to handle elderly care, but not a burgeoning baby boom. Second are the multiple risks associated with cities that are over-connected, where multiple drivers may interact and cause severe impacts over large scales. While the internet of things (IoT) promises to allow public utilities to control electricity consumption from afar, for example, or a city might be reliant on an economic network that stretches across the globe, these seeming boons are potential banes in certain circumstances. Cloud computing and internet connections make institutions and individuals vulnerable; a city with an infrastructure or services based on IoT might be more vulnerable to economic upheaval or digital sabotage. Evidence comes from recent hacks of companies, but also the threat of e-sabotage to electrical utilities, for example. Invoking internet threats is unnecessary: electricity outages have always been a possibility for interlocking systems overloaded by demand at peak hours, say, for running air conditioners during heat waves. We will address both of these problematic areas here, and provide some ideas on how to address them. Four decades ago, the French evolutionary biologist and philosopher François Jacob published a seminal paper in Science that pointed out that evolution proceeds very differently from a process that is designed and engineered from scratch.2 2. Jacob, F., 1977. “Evolution and tinkering.” Science 196(4295):1161-1166. DOI: 10.1126/science.860134 See all references He labelled this evolutionary process “tinkering”. Primarily based on modifying and moulding existing traits, small adjustments and tweaks can occasionally result in completely new functions when conditions change. For example, ancient creatures’ basic extremities may have evolved along divergent paths, to function as fins in water, legs on land, or wings in air. This insight could help guide future design of new urban infrastructure and the redesign of existing structures. Investments in infrastructure to fulfil one function may often create a “lock-in” situation that can last for decades and even centuries. An urban tinkering approach could help reduce such lock-ins, by designing infrastructure with an inherent flexibility and potential to change function in the future if needed or desired. An urban tinkering approach may also help invent new functions for existing infrastructure, such as for the Corniche in Dakar. Another example is the river walk in Seoul: the city removed the concrete roads and an elevated highway constructed atop the Cheonggyecheon River, which was restored with parks along its banks. This intervention led to lower temperatures in the city, increased physical activity for city residents and higher social cohesion, and improved biodiversity by bringing back birds, fish, and plants. 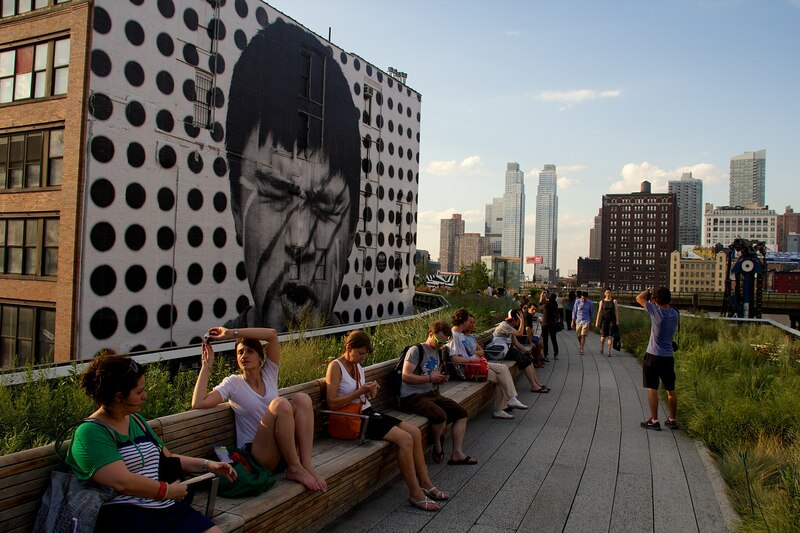 The tinkering approach that led to the Cheonggyecheon river walk is similar to another oft-cited example of a so-called linear park: the High Line in New York City. Once a cargo railway line, the High Line had become obsolete by the 1980s. Residents of the surrounding neighbourhood invented a new function: an elevated recreational park built along the tracks. Today visitors and residents alike flock to this old infrastructure, and art museums, restaurants, and high-end housing have sprouted alongside it. Numerous cities around the world have made similar creations, reinventing and revitalising old structures for new purposes. For example, many cities have transformed vacant lots and other underutilised urban spaces into community gardens, often leading to improved social cohesion in neighbourhoods, engagement with elderly members of a society or opportunities to teach children about farming, and increased biodiversity in the centre of a city. From an urban reuse and renewal perspective, for example, the Brooklyn Army Terminal is now home to small companies, art studios, manufacturing sites, and even a chocolatier, which have taken over the warehouses and cargo areas. Solar panels grace the roof and batteries stored in the basement create a renewable energy source for the tenants – and an example of lower energy use for a “smart grid” for the city if the experiment can be expanded. We believe the concept of urban tinkering could be very useful in addressing many of the urban challenges facing us in the long term. This kind of urban evolution could help us prepare for uncertainty and nonlinear, unpredictable changes. By reducing strong path-dependencies for planned infrastructure, this could help city planners and managers anticipate that some infrastructure may completely change its original intended function. The benefits from these transformations of urban infrastructure could be many. The concept of “hyper-cohesion” represents the ever more economically, digitally, socially, and ecologically globally connected networks. The rates at which these networks are becoming more connected are increasing with time. Severe risks might be associated with an increasingly hyper-cohesive world. For example, increased vulnerability in power grids might lead to outages that cascade through energy systems to create widespread blackouts, an event that has happened multiple times in the last decade in the United States. Those events hint that overconnectedness can be a problem, but a lack of connectivity can create risks as well: redundancy and backup systems are a necessary characteristic of resilience. Intermediate modularity and connectivity in systems could provide an important new target for urban regional resilience building. In such cases, energy, economic, and even social systems have protections in place for limiting impacts of failure in one part of the system while remaining connected. The internet is a useful model for intermediate modularity and connectivity. Protections such as firewalls are in place at multiple scales – from individuals’ and institutions’ devices to nation states – to protect subsystems in one part of the system from failing when subsystems fail in another part. To deal with hyper-cohesion, we suggest that tinkering and advancing concepts of intermediate modularity and connectivity can create flexibility and adaptability in the way we build and re-build cities on this urbanising planet. But small steps are not sufficient. Cities and city regions around the world are very different. Aggregating information from individual urban centres to get a global view requires a deeper understanding of how they are affected by larger trends. We and our colleagues have attempted to map current trends in urban development around the globe, based on two independent defining variables: the rate of population change – which may be rapidly increasing, stable, or shrinking – versus an economic state that is either affluent or less affluent. The effort of mapping these trends reveals different proxies for how to measure urban development. For example, greenhouse gas emissions per person and land uses can paint a useful picture of how urbanisation is unfolding in different areas.3-4 3. World Bank, 2009. World Development Report 2009: Reshaping Economic Geography. Washington, D.C.: World Bank. Download (License: CC BY 3.0 IGO.) 4. World Bank, 2010. World Development Report 2010: Development and Climate Change. Washington, D.C.: World Bank. Download (License: CC BY 3.0 IGO.) See all references Affluence in general is the main factor behind greenhouse gas emissions per capita; emissions are large in affluent cities, whether they are growing rapidly, stable in their population size, or shrinking. Land use change is significantly larger in affluent, rapidly growing urban regions than in other types of regions, where agricultural lands may be turned to urban uses at increasing rates, for example. 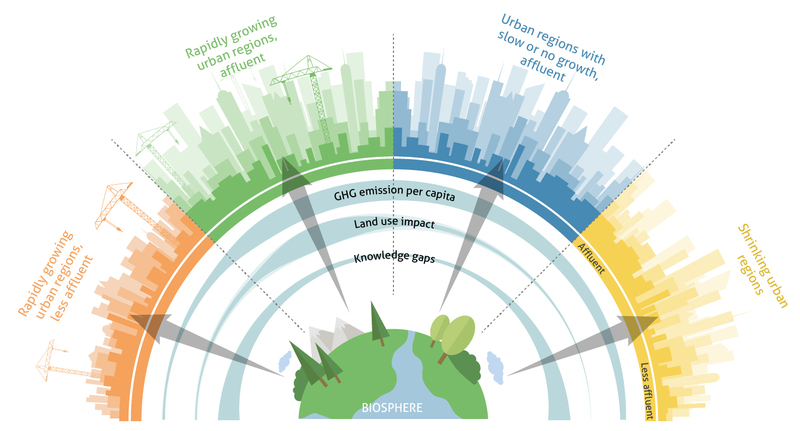 Current trends on our urban planet: greenhouse gas emissions (GHG) per capita, land use, and knowledge gaps differ according to how a region is growing or shrinking, and the level of affluence in that urban area. Illustration: Jerker Lokrantz/Azote. However, many variables that we would like to analyse and that are highly relevant for policy are difficult to pin down. We know very little about the governance challenges, health impacts, adaptation capacity to climate change, and other characteristics. These large knowledge gaps hold for rapidly growing, less-affluent cities, as well as for shrinking cities and city regions. We and our research colleagues have explored key elements of urban knowledge and the state of the art in urban thinking, to pinpoint the knowledge gaps we need to fill in order to advance urban sustainability, in a new book, Urban Planet.5 5. Elmqvist, T., Bai. X., Frantzeskaki, N., Griffith, C., Maddox, D., McPhearson, T., Parnell, S., Romero-Lankao, P., Simon, D., Watkins, M., eds., 2017. Urban Planet. Cambridge University Press. ISBN: 9781107196933, forthcoming. See all references Some practitioners have explored an element of city building from the “street level” points of view of designers, artists, and practitioners in civil society – providing “provocations” to think differently than traditional urban planners might. Collectively, we explore what we know about cities, where the frontiers and limits of urban research and practice lie, and the fault lines that point towards areas we need to know more about. Much of what will happen in the future, both in individual cities themselves and across the global urban system, will come down to citizens and political decision makers. But the patterns, processes, and risks that we don’t understand on our urban planet will also determine the future of life on Earth. While we suggest that tinkering is an approach to finding solutions to some of the issues urban centres will face, we also acknowledge that large-scale, complex-systems thinking is necessary to make way for better urban futures. Evolution is useful, but so is building well from the beginning. 5. Elmqvist, T., Bai. X., Frantzeskaki, N., Griffith, C., Maddox, D., McPhearson, T., Parnell, S., Romero-Lankao, P., Simon, D., Watkins, M., eds., 2017. Urban Planet. Cambridge University Press. ISBN: 9781107196933, forthcoming.